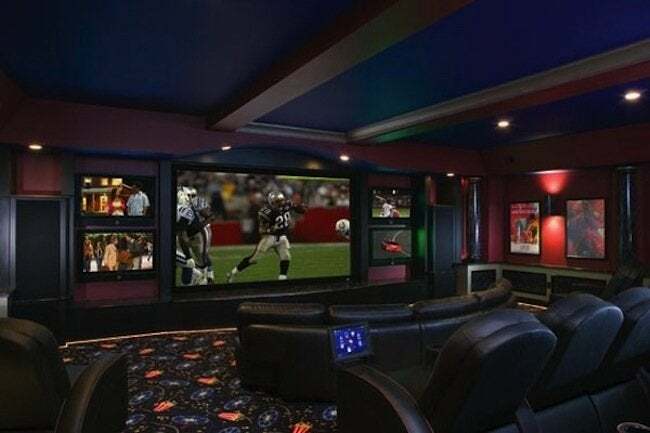 Millions of Americans are plugging into dedicated home theaters as their ticket to relaxation and casual entertaining. Though any space with a TV and a surround sound audio system qualifies as an entertainment area, only a home theater room simulates a sensory cinema experience. Here are four key considerations to help make an attractive, comfortable space with top-quality acoustics and viewing. Unless you have exceptional wall insulation, locate the home theater room in an area of the house where ambient noise won’t disrupt viewing, and where cinema sounds won’t interfere with other household activities. Possibilities include a basement or a space adjacent to the family room with minimal natural light. Choose a rectangular-shaped room rather than a square space where sound build-up bounces off the walls. For excellent acoustics, most design experts suggest an area that measures about 20′ x 13′. Others point to an acoustics room ratio, which indicates that room width should be 1.6 times, and room length should be 2.6 times, the ceiling height. Considering cinema sound is as powerful as its imagery, acoustics deserve to be a big deal. Deciding between a television or a projector should be based on how you plan to use the room. If you’re keen on TV programs or gaming, then image quality is usually better on a flat-screen TV. But if you’re more interested in watching movies (DVD, Blu-ray, HD-DVD) and entertaining friends, then a projector offers the better picture, the largest screen size, and a more authentic experience. Projectors trump televisions in tendering realistic 3D escapades, too. Remember the days when owning a 27″ TV model practically ensured you’d be hosting the next Super Bowl party? Today 4′ and 5′ screens are the norm (with 6′ and 7′ models gaining ground). Bigger isn’t always the best choice, however. When the screen is too large for the viewing distance, the individual pixels are evident, and the eyes are strained by the need to scan the whole thing. When the screen is too small, viewers miss the experience of being drawn into the show. As a general rule, select a screen size that is about one third of your viewing distance. For seating about 13′ (156″) from the television, for instance, opt for a 52″ screen. One way to test optimal viewing distance is to measure between your seating area and the television, then stand that far away from the displays at the store. If you can see a model’s whole screen without moving your head or eyes, you’re in the right range. A home theater room can trump even the poshest cinema in terms of comfort and personal style. To set a specific mood, turn to theme decor ranging from swanky Hollywood glamour to cozy wine bar or lively ’50s drive-in. Or take design cues from favorite genres like Westerns or from beloved series like Lord of the Rings. For the sake of both comfort and acoustics, begin with carpet that adds warmth and absorbs sound. Next, indulge in comfortable seating. Though sofas, chairs, and even bean bags will work, the ideal arrangement is a row or two of cushy chairs facing forward to mimic theater seating. Consider using risers or platforms to elevate the second row and add LED step lighting that can be dimmed. In fact, wall sconces and subtle lighting controlled by a remote can greatly enhance mood—everyone enjoys the suspense when the lights go down. And because you want things as dark as possible for improved viewing, choose deep colors for walls and dress any windows with blackout curtains. Finally, add in special touches like a star ceiling made from fiber optic tiles, acoustic panels on the walls, a mini concession stand with popcorn machine, movie posters and a velour curtain to trim out the screen.